Turn on a hose on low for a 1/2 hour at the base of the tree. Place a 5-gallon bucket with holes in the bottom at the base of your tree. Fill the bucket up five days a week. This entry was posted in Tree Care and tagged summer, water. Bookmark the permalink. This would be easier to do if Arlington County wasn’t charging me double for water used in watering trees. AC assumes that all water I use goes down the sanitary sewer. Get them to change that thinking and I’ll think about watering trees. This is tough. The citizen advisocry committee looked into the logistics and found it would be extremely expensive to install the separate meter system countywide. So it comes down to judgeing whether the tree is worth the money spent on watering. I figure it costs me another $60 annually to regularly water so I just see it as another expense. You don’t have to install a separate water meter. Fairfax Water looks at usage during the winter vs. summer and assumes that overage does not go down the sanitary sewer but is used for other purposes such as car washing and watering. From the Fairfax Water website: “Sewer usage is based on water consumption during the current billing period or the preceding winter quarter billing period, whichever is lower. This prevents residential customers from being charged sewer rates on water used outdoors during the summer.” Why can’t Arlington do this? lets see, The sewer rate is $8.51/1000 gallons imputed on your water rates. 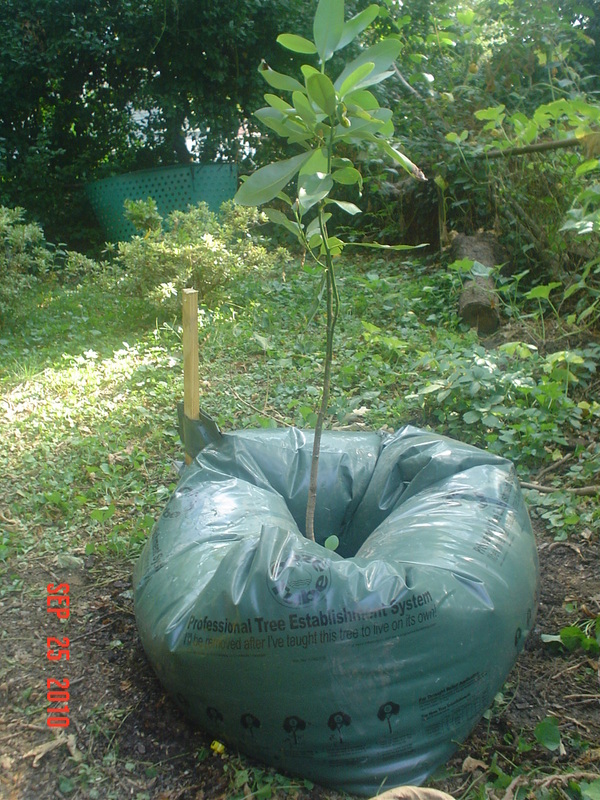 to water a tree would cost 25 gallons a week if you used a big gator bag. say 3 trees you choose to water, would be 75 gallons a week. Summer drought is say June,July,August,September. say 16 weeks. cents to preserve 3 trees. Now who would refuse to spend $10 to save three trees? I’m guessing a republican. Now who would refust to spend $10 to save three trees that improve your property value by several thousand dollars? I’m guessing a staff member for the house GOP caucus.